Single parents need to be creative. My boys both wanted some new Xbox game that just came out. I said jokingly, that they could have it as long as they were willing to trade no new groceries for two weeks. “YES!”, they say. I double check,”‘Are you sure?”, “YES!”, they say again, so new Xbox game it is. For this single mom challenge, it is decided that besides milk and bread, there won’t be any other grocery purchases, and they are actually happy. 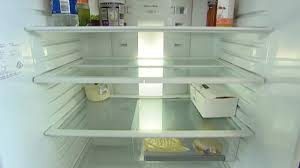 There is still a lot of food in the house, cans of this and boxes of that, but we will run out of fresh vegetables and fruit, juice, and junk food. new Xbox game or food? they happily picked the game, gotta love it! I do take them to the store, and say that they can pick out three things each, things for the next two weeks. And what they got surprised me, things that would last a few meals. They had some items in mind and it went like this: Cameron got perogies, ranch dressing, and a jug of salsa, Mikey got a flat of Mr. Noodles, jar of jam and jug of chocolate milk, and I picked lettuce, eggs, and tomatoes. These past two weeks have gone well, the fridge was empty enough to clean, (see image to the right, lol) and older food stocks got rotated. Today I bought new groceries and I am so looking forward to a big salad. Got leftovers? or maybe a surplus of something like cream cheese or mashed potatoes? Here’s a great site on using leftovers or surplus food!